It’s hard to believe that December is here and we are inching ever so closely to February!! Making it through December will be my biggest challenge as it is our busiest month (usually works out that way with the holidays). Though, once December is over, it will be smooth sailing straight through to the big day. This was the start of our busy weekends in December. As per usual, we’re trucking along during the week with work and miscellaneous stuff here and there. Come the weekend, we had some very exciting plans. When I worked at Washington, I was lucky enough to have made some really great friends. One of them, Cody, is extremely talented and does one play a year. Last year we went and it was such a good time, so we knew when he was in a show this year that we’d want to go as well. There were nine of us in all who went to support Cody in his play The Complete History of America (Abridged). Before hand we all met at Jose’s Blue Sombrero, a favorite, for some Mexican and laughs. We headed to the show after dinner, grabbed our beverages (Katie brought me Starbucks), settled into our seats and were ready to see what the show would bring. All we knew about the show was that at one point Cody played Abe Lincoln. I should add, that the Sixth Street Theater (where the show was held) is a very quaint location. It doesn’t seat very many people and you feel a part of the show as the actors are right in front of you the entire time. This means, no sudden movements or chatting on our part because they really can see you!! Two hours and an intermission later, I was still laughing. The show was beyond hilarious. Basically it was set up as if the three men involved were giving us a history lesson as to how America came to be. After the show we headed to an Irish bar where we broke out Trivia Purist and had some more great laughs!! Saturday night we had Ben’s work Christmas party. The food was fabulous, but it really was the first time I’d experienced being full before I even started eating. I anticipate this will be something that will continue to happen as the weeks past. 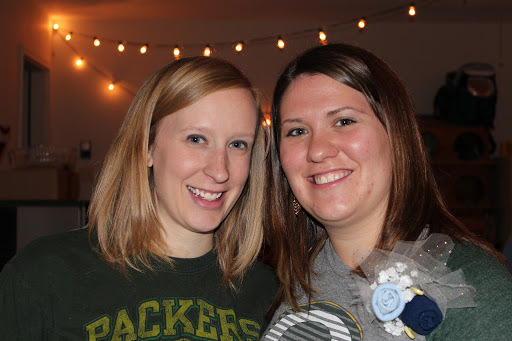 This week was an extra special week because not only were we celebrating Zusan Christmas, but there was also going to be my first baby shower. It was bound to be a great week, but I ended up with the flu (fever, cold type) on Monday and Tuesday so I was hoping for a fast recovery before the fun started. Luckily, I only had to miss one day of work, but I do remember telling Ben at one point if the labor aches are anything like that flu aches I’m never going to survive. By the time family started to arrive (the Scott’s and the girls of the Indiana Zusan’s stayed with us) I was feeling much much better. Zusan Christmas is a unique tradition as we rotate between where it will be held and instead of presents we adopt families. It is something that I really enjoy because I love knowing that we are helping to give the less fortunate a little holiday cheer. This year, Christmas was being held at my in laws, even though it was set to be held in Indiana, changes were made to accommodate Grandpa Zusan. The “host” family is in charge of adopting the families and letting their own families who will be purchasing what. 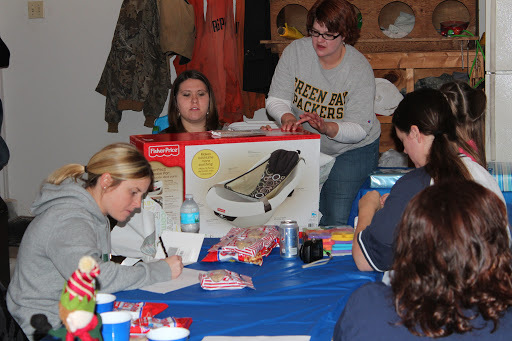 We then do all our shopping and on the day of the event bring all of our gifts to get organized together. Depending on where we have Christmas (Indiana, Oak Knoll or Muskego) depends on whether or not we wrap and/or deliver the gifts to the families the day of. This year since it was in Burlington, we bagged them all up (unwrapped) and Love took care of the rest. 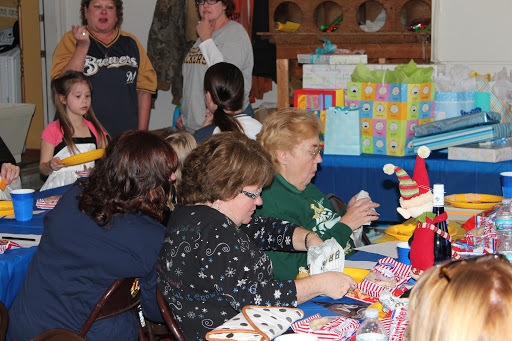 Besides the gifts for the families, we do a white elephant gift exchange for the adults. This year we decided to do “one man’s junk is another man’s treasure.” Ben and I gave two years worth of old Playboys and an old computer that doesn’t work. In the end we got some golf balls and a cool wine thing. The owners of our gifts were clearly excited!! New to Zusan Christmas this year was a cookie exchange. We had to make five dozen cookies and then we all made boxes from everyone’s cookies. There were so many yummy kinds!! All in all, it was a great day filled with lots of laughter and food. The family is getting bigger by the year, we’re up to 13 kids now, so they all had a lot of fun playing together. The adults of course had fun too. 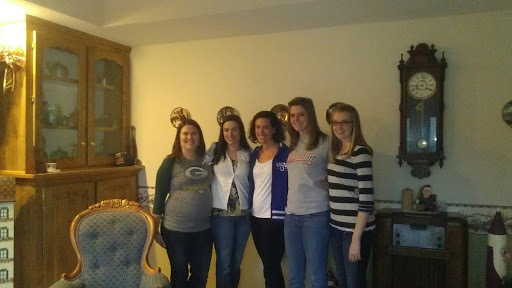 My “sisters.” Love these girls. Even more so that they’ve adopted me into their sisterhood. Little Fia loves Baby Henry more than anyone. She loves to play with the belly, but has to see the whole thing. Having a 2 year old ask to “see the belly” and lift your shirt up is priceless. 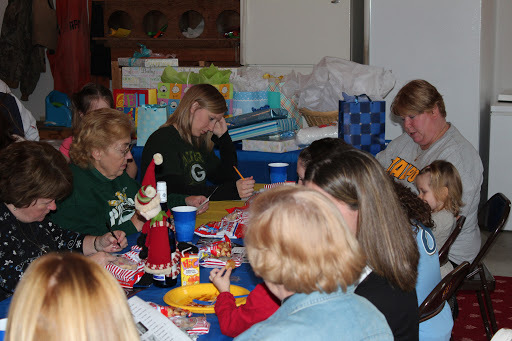 The day after Zusan Christmas was my first baby shower. I was so excited for it. The shower was thrown by my mother in law Chris and my two sister in laws Kelly and Courtney. 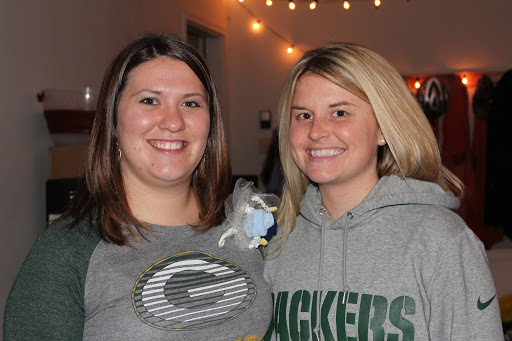 It was Brewer’s themed (people wore their favorite sports apparel), which is appropriate considering, and all the food was tailgate food. Needless to say it was hard to walk away from all the dip!! 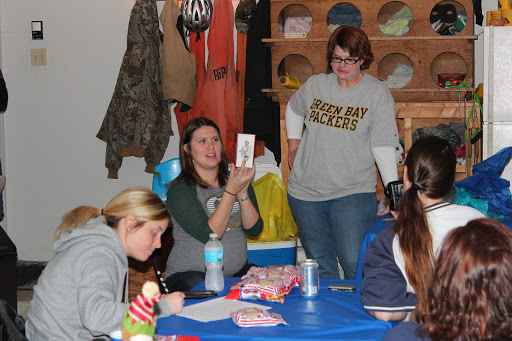 One of the games we played was guessing which baby picture belonged to which guest. Looking at all the pictures was kind of hard. They were in black and white, which made it extra tricky. Sadly, I didn’t even know which one was me at first. Though in the end I was the winner with 19 correct. The next game involved my niece Camyle walking around with a bunch of baby stuff on a tray and baseball themed pictures on her clothes. 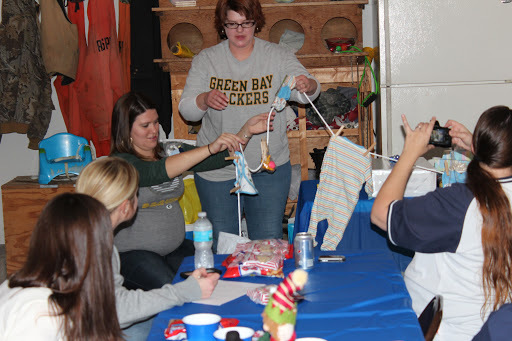 Everyone paid attention to the baby stuff and not the baseball pictures, which is what we had to end up naming. Katie won that game. She’s good at paying attention to detail. Having everyone come celebrate the life of little Henry was so nice. He isn’t even here yet and by the amount of presents we received, he is clearly loved!! Thanks to all that came to help us celebrate. It was great to see everyone and I am beyond thankful for all the love that you’ve shown our little guy. He’s lucky to have everyone in his life. The most adorable blanket from my sister in law Kelly. I love it so much I’m afraid to use it. 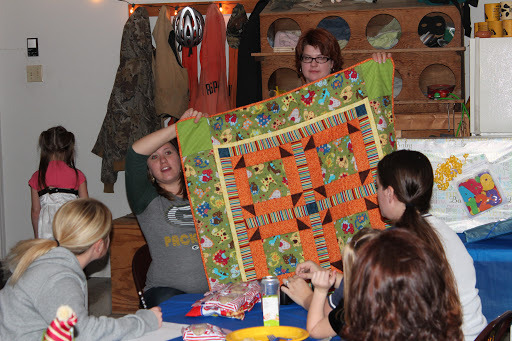 Chelsea holding up the “close line” gift. which stretched well across the garage. At his point, pregnancy is still a “breeze.” Every time I say that I swear someone smacks me upside the head because they probably had an awful experience. Clothes are getting tigther, food is still yummy and I’m moving slower, but in the end I adore being pregnant. 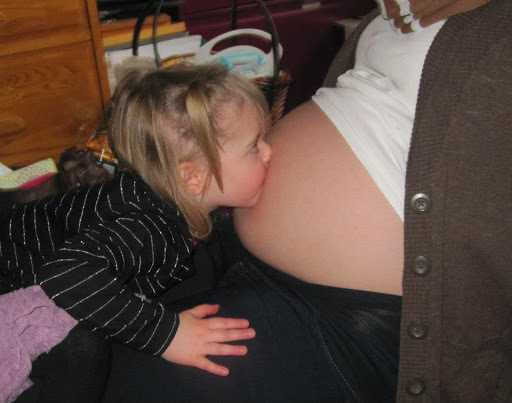 If every pregnancy were the same, I’d do this as a job. How Far Along: 32 Weeks 6 Days. Week 28 baby was the size of an eggplant and week 29 baby was the size of an acorn squash. Maternity Clothes: Everything is starting to get a little small as I start to get a little bit bigger each day. Ben’s laundry piles are starting to get bigger each day as I mostly wear his clothes once I get home from work. Miss Anything: Wine and lots of it! !